Long ballots are leading to worries of long lines on Election Day in Summit County. Officials are urging voters to either do their research before voting in-person, or take advantage of voting by mail. Summit County is urging people who wish to vote in person to do their research on the issues and candidates before coming in to cast their ballot. The length of this year’s general election ballot is so extensive that voters are taking a long time, as much as 40 minutes, to read through all the different propositions, amendments, initiatives and local issues before making a decision. County clerk and recorder Kathleen Neel said that she predicts a higher than average midterm election turnout this year, and is concerned about extended lines at polling locations in the county on Nov. 6. The lengthiness of this year’s ballot is owed to the wordy questions posed for voters. For example, Amendment 73 — a proposal to institute income tax brackets, raise corporate taxes and taxes on individuals making more than $150,000 a year for a public education fund — is a hefty 286 words, or over one whole double-spaced page of text in 12-point font. Amendments Y and Z — proposing to change the way state and congressional districts are drawn to prevent political gerrymandering — are a little over 440 words combined. Just the title of Summit County Initiative 1A — which would institute a temporary mill levy to raise funds for early childhood care, mental health resources, recycling, wildfire mitigation and infrastructure — comes in at 51 words, with the entire initiative spanning 219 words. Amendment 74 — a proposal largely backed by oil and gas interests that would require local or state government to compensate property owners for any change in fair market value — wins the prize for shortest question at 35 words. 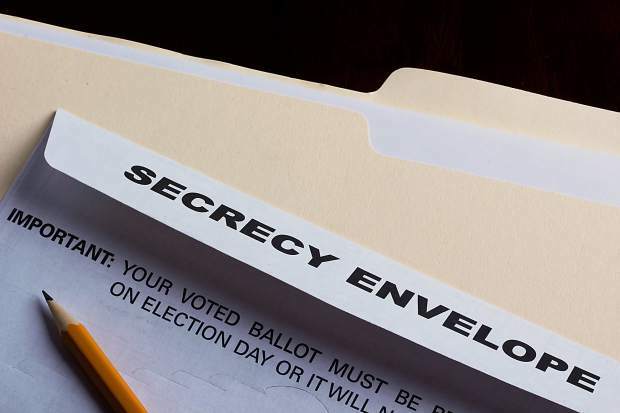 To save time at the polling booth, Neel encouraged voters to do their research about their ballot ahead of time, such as the ballot information book, or Blue Book, that is mailed to every voter with an official analysis of each item on the ballot. Neel said that her office has counted 1,200 ballots in the two days since her office started receiving them. While it was not immediately clear if that’s more initial ballots counted than years past, Neel predicts a high county turnout overall. Though that means a lot of work for her office, Neel couldn’t be happier. To access all official county election information online, including sample ballots and the Blue Book, visit SummitCountyCO.gov/election. For reference, this entire article is 524 words.